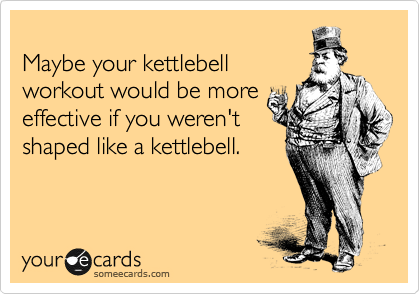 Frankenstein and Kettle bells – Random. Structured. Haphazard. All Me. Disclaimer: I have no verifiable knowledge that Frankenstein’s Monster ever used kettle bells on those brawny arms of his. However, if he had, it would totally explain why he walked like he had an atomic wedgie going on 24/7! * For the uninitiated am going to add a link here about what an atomic wedgie is. If you need to refer to the link then you’re one of the good ones who doesn’t believe in noogies and spitballs either. I’m not posting a picture of the horrors of an atomic wedgie because it may very well fall under cruelty to animals. Let’s continue shall we? Well…I’ve been quite wishy-washy about going to the gym and I paid for it. Oh boy, did I pay for it! My gym instructor thought I should try out the latest instrument of torture aka the kettle bell. I tried it and by the end of the routine this was me; praying for deliverance! Anyhoo, all that praying didn’t get me much. Then. Once I got back home and over the rest of the day it seemed like someone had applied the brakes to my thigh muscles. I’ve heard of lockjaw. And now imagine lockthigh instead. Or rather imagine a short round woman walking like this for 2 days! But much S-L-O-W-E-R!! Everything about growing older, not eating right, not taking care of your body comes with huge epiphanies. Mine was all the couch potatoness I’ve displayed all these years. I could have read while using the treadmill or just taken out 20 minutes out of my day even every alternate day and done *something*. I didn’t. And fell prey to an innocuous-looking cute, round thing which now I equate with being on the rack! Jokes aside…don’t go to the gym if you don’t want too much structure and routine. But take care of yourself else it comes back and bites you on the rather sizable glutes you’ll end up having. People don’t know what lifting weights is till you’re pulling your body up from a slanted plane or holding it up on your elbows while trying to stay steady and not belly flop on the gym mats. Or when your arm muscles jiggle like Jello and you find yourself wanting to melt into a puddle because then you wouldn’t be in any kind of shape and hurt. But stick with it and the endorphins kick in and it actually does ease the aches and pain. It also makes you want to try out latest bane of your existence, if only to conquer it once and for all!